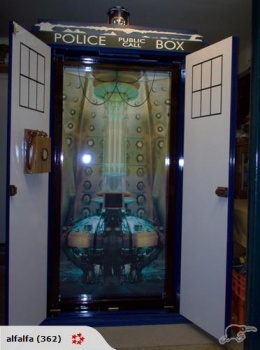 One lucky kid in New Zealand received a custom-built TARDIS themed bed. He's decided against using it, though, so his dad is auctioning it off online. The Best Dad in the World apparently lives in New Zealand, and to defend his title, he built his son a custom-made TARDIS-themed Murphy bed. The kid likely couldn't sleep for pretending he was a time lord, so the family isn't keeping the bed. Instead, Dad is auctioning it off on the New Zealand auction site Trade Me. The father/builder describes every last detail of the bed on the auction listing, including "a chain of LED lights on the roof...it makes your whole ceiling look like the Tardis is taking off its mind blowing! Once you open the 1970s lock, you will find a handmade Doctor Who replica talking , yes I said talking telephone! It says 3 or 4 different things, then when the secret button is pushed the green light turns blue then pulses and makes the Tardis sound. It is loud enough to know when your child is not sleeping!" Or, perhaps, your adult wife, who bought this and set it up in the spare bedroom to pretend she's traveling through space and time. The listing describes the bed as child-sized, but who knows: Maybe it's bigger on the inside.